Your studio apartment feels smaller than a walk-in closet. Of course, you pared down to your beloved essentials, but it didn't change the fact that you live in a single room, and it's frustrating. You feel like you're living in a dorm instead of a grown up home. We get it. The good news is your crash pad no longer has to cramp your style. There are plenty of ways you can transform the square footage you have into the functional and comfortable abode that you deserve. First step: Look around. Your current layout may be causing your small space problems. What's the cure? 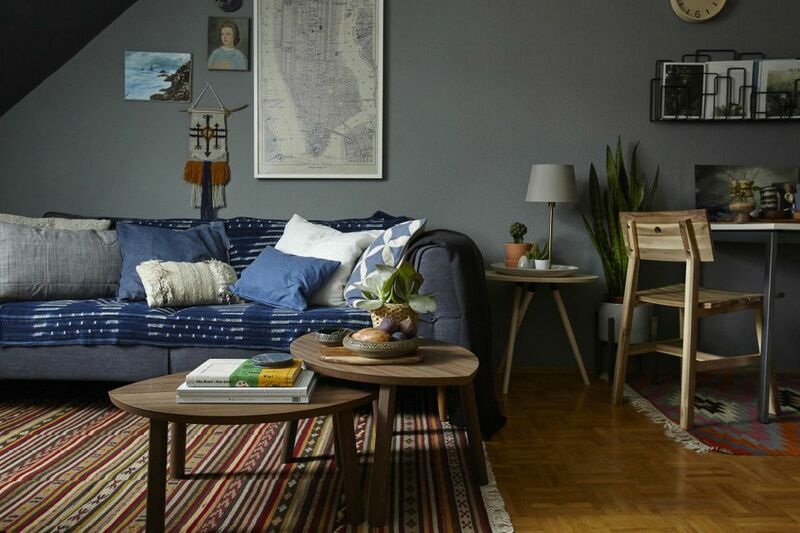 The following ideas share how you can use furniture and décor to optimize every square inch of your apartment. Dividing your square footage into zones for specific uses will transform your studio into a multiroom home. For example, does your apartment feel more like a bedroom than a multifunctional space? A half wall or free-standing screen will create the separation you need to create a living room or home office. To do, just place your divider in the middle of your space. Want more storage? Use a shelving unit to create your new layout. Here's a glimpse of the bedroom behind the half wall. You're dying to host a cozy dinner party, but you don't have room for a dining set — not to mention a sofa. What to do? Turn to your walls! Untapped vertical space will help you create a double duty nook. Shown above is how you can fit a dining alcove into a tight corner. The image below reveals how easy it is to convert the same space into a comfy lounge. Thai massage mats or any of these roll-up floor beds. Here's how you can convert your dining alcove into a welcoming lounge. First, take the rolled mats off the walls so you can hang up the chairs. Next lower the height on your adjustable table and unfurl your mats. Now you have a comfortable seating area that you can top off with cozy pillows. Hurray! You finally found a small studio you can afford. The only bummer: It doesn't have a closet — zip, nada, none! But no worries. All you need is a slice of floor space and a curtain to create a drool-worthy custom closet that will make every apartment dweller you know jealous. Check out the photo below. Yep, this DIY closet is filled with floor to ceiling storage. All of the components shown here came from IKEA. What we heart best about this idea, is that it allows you to create custom storage that fits your style and budget. Don't just plunk down a chair in a corner. Use wall art to carve out and define your little nook. Lighten things up. Add a floor lamp or wall mounted light fixture will make reading easier. Get a table. A tiny one will give you a place to park a drink or your feet. You can also use paint to carve out a reading nook in an untapped corner. After you painted your spotlight, add the furnishings listed above. If your studio apartment has an impressive view, turn it into a focal point you can enjoy with a DIY window seat. A shelving unit turned on its side, like the Kallax by Ikea, will carve out a spot in your tiny castle where you can read or daydream. Just remember to add a few cushions or pillows for comfort. Making the most of a micro-sized studio is super challenging. A loft bed will make your small square footage sing. The one shown here carves out a small sitting lounge underneath. The compact desk in front creates a compact wall that adds privacy. Easy an easy and peasy, and inexpensive way to carve out a bedroom. Nothing defines a space quite like paint. The contrasting wall colors shown above divides the studio apartment into two distinct rooms.